Build even more influence on Twitter was posted on November 18th, 2013 at 11.14pm and is filed under Business, Marketing, Social Media Marketing, Social Networks, Twitter..
You may already have a page on Twitter but do you have as much Klout as you should, as many followers as your brand commands? If your business does Twitter well, you’ll get discovered by prospective customers and get to know your existing ones better. You can engage with them in real time, anywhere, in a highly personal and approachable way – informing, sharing ideas and inspiring them – and listening and learning about what they really think. Anytime. We’ve always felt that Twitter is the SME’s best friend. The one social network who gives businesses – whatever their size – the fairest chance to develop their brand, grow their influence and add loyal customers to their following. In the UK and globally. Over the years we have community managed over thirty Twitter accounts for clients ranging from PLCs including a leading recycling manufacturer, the digital TV sector and even the NHS. And delivered workshops and one to one coaching to dozens of enthused tweeters. Meaning we really understand the social network and all the tools that continuously become available to optimise its usage. Well placed to provide robust cross cultural marketing insight, we also help businesses make the most of Twitter not just in the UK. Internationally too. And, of course, taking a different approach in different regions makes a big difference to how successful your page is. So naturally you’d expect us to embrace any enhancement the social network giant introduces to make Twitter even better for its corporate users. And we do! Since October 25th, it’s all been happening. But we’re not talking here about Twitter’s stock market debut sending the social network’s value to a mind boggling $24bn. No! We’re talking about something more profound that recognises the role Twitter has and can play with SMEs. Something we at Ohh La La have known since 2009! And it’s not just for the USA, where – let’s face it – the majority of followers have been (53 million out of 200 million users globally). Naturally that was where the social media giant focused its effort and generated most advertising revenue. 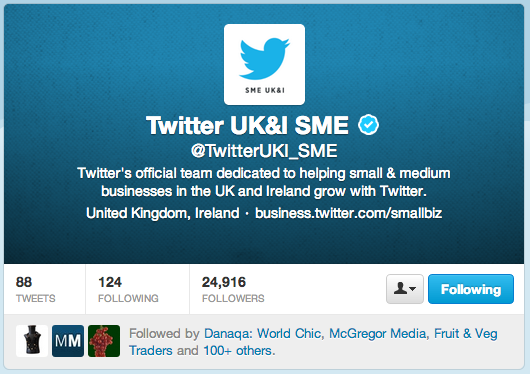 The social network has appointed a team dedicated to “helping SMEs in the UK grow with Twitter”. And to make it happen it has launched a dedicated Twitter page @TwitterUKI_SME, clearly signalling it wants a big piece of the action in the SME sector. That’s a market with an estimated 4.89 million businesses where SMEs account for 99.9% of all private sector businesses, with some 62.6% being sole traders. (Source). All very timely just a few weeks from European SME Week. Just more good news for the shareholders and billionaires co-founders, Evan Williams and Jack Dorsey? At Ohh La La we think there’s more to it than that. With Twitter’s new package, and a bit of help from Ohh la la, your business could hit the jackpot too. From breaking into a new market to becoming known as a thought leader So what’s to stop you?